When we first started this blog we knew that one of our Adventures had to be a winery tour up in Santa Barbara. 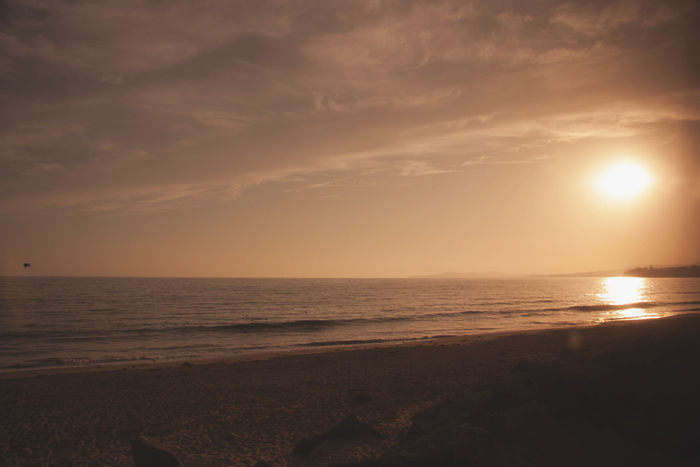 It's something we'd always wanted to do and thought it would be a perfect post full of fun times and amazing photo ops. 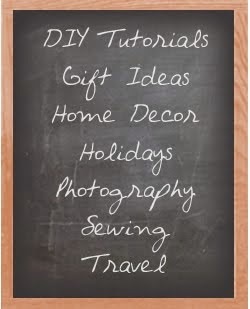 Usually an epic weekend away such as this involves some planning so we added it to our list of ideas and figured we'd get to it when the time was right. Cut to the two of us driving out to the country on the way to our berry picking adventure, chatting about our weekend plans and realizing we had none. Amber: "So what are you doing tomorrow?" Amanda: "We should go on that winery tour"
And that's how we decided to forgo all planning and book it from the front seat of my Yaris. We already knew that we wanted to go on this bike/winery tour that we'd seen during one of our nights of documentary watching and luckily they still had room on the tour! (aka we were the only ones). 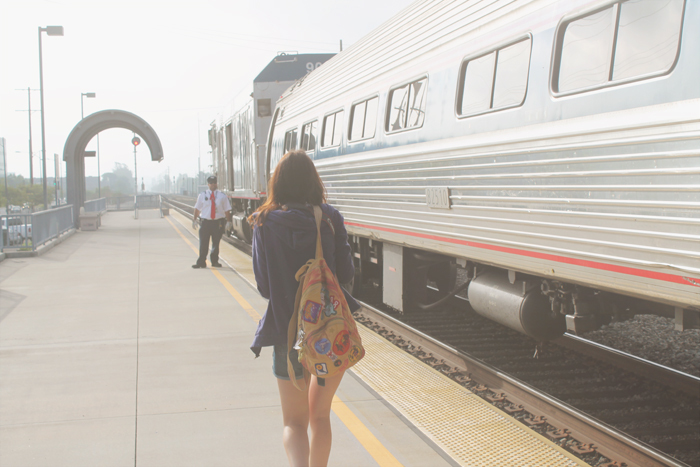 Our plan was to find a cute little B&B to stay at over night but for some reason everything in Santa Barbara was either booked or $500 so instead we decided to take the train. 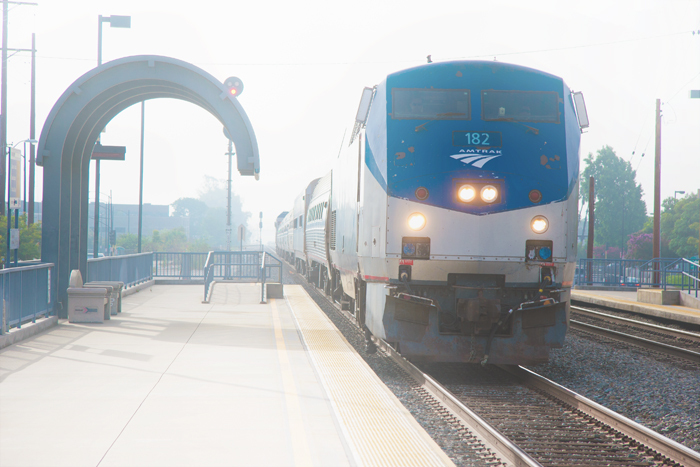 Santa Barbara is only 2 hours away by train so we booked two tickets to take the Amtrak out in the morning & back the same evening - and the awesome folks at the Santa Barbara Adventure Company offered to pick us up at the train station. So bright and early around 6am the next morning we were ready to roll. After a quick drive-thru Starbucks and a short wait/photo shoot at the station we were on our way. The train ride was awesome and is highly recommended. We got to relax with our coffee and biscotti (there's also a coffee car on the train that even serves wine & champagne) and enjoy the lack of traffic & the beautiful coastal view. The train was also super empty so we grabbed a set of facing seats which doubled as excellent footrests. 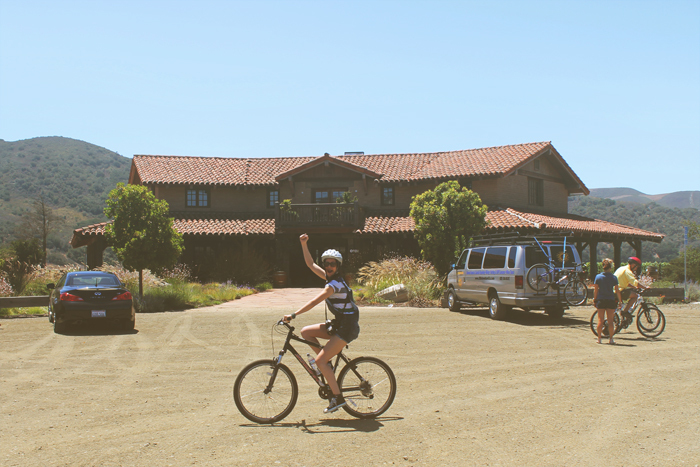 As promised, our guide from the Santa Barbara Adventure Company was at our final stop awaiting our arrival. We climbed into the giant adventure-van and were met with our first surprise of the trip - a couple from Texas had joined the tour! They were on their belated-honeymoon and this was not only their first time in California but was to be their first time ever drinking alcohol! They were super shy and really sweet and were probably scared of us as we started a sing-along on the 40 minute drive into the Santa Ynez Valley. We had wrongly assumed that our first task upon arrival would be to get outfitted with some bikes, but nope, apparently a wine tour begins and ends with wine. 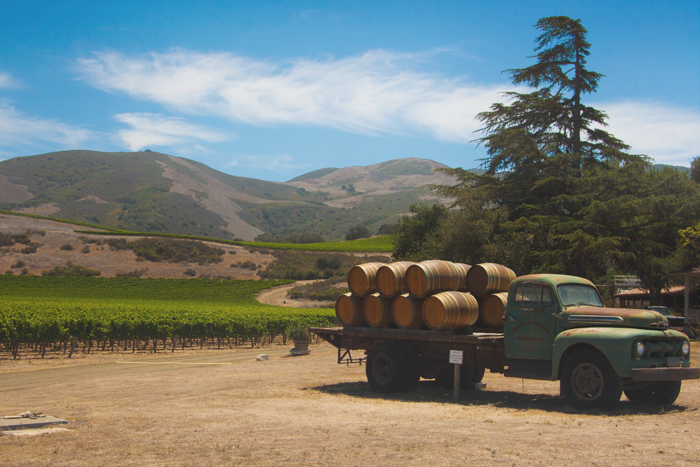 Our first stop was at the stunningly beautiful Sanford Winery, located in the heart of the Santa Rita Hills. We sampled many wines and got to know our new Texan friends as they got to know their Chardonnay, Pinot Grigio, Merlot & Cabernet. By the end of the tasting they were cracking jokes and talking about their honeymoon night - and we were digging our way through the bowl of free crackers hoping to make our bikes less wobbly. As soon as the first tasting was done we headed out to the van to be outfitted with our gear. Thankfully they also provided helmets. ...we were on our way! 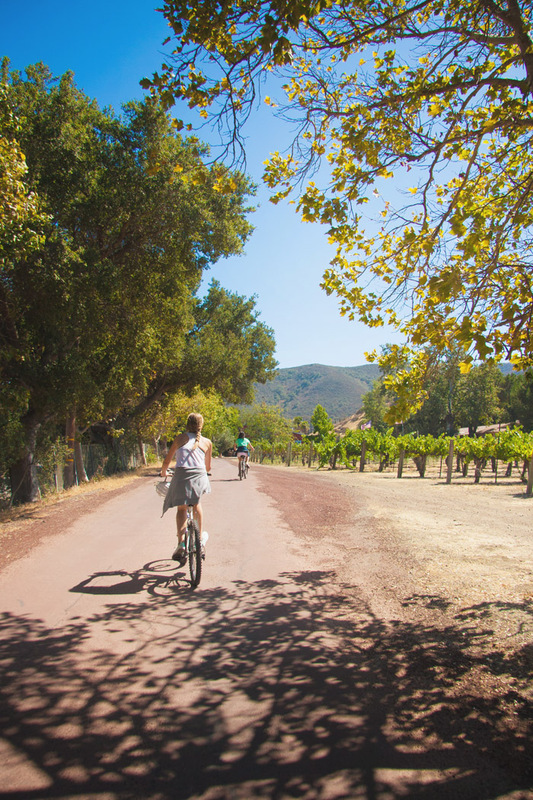 The length of the bike tour was about 12 miles, through the winding Santa Rita Hills. The first portion of the trip involved making our way up a massive hill which is pretty hysterical after a pre-lunch wine tasting. 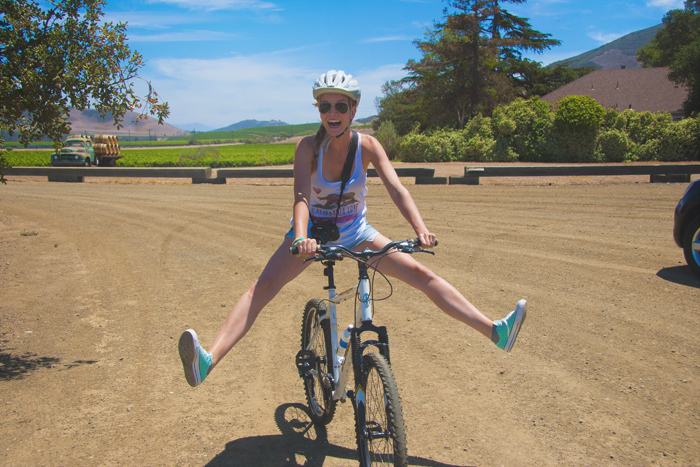 Pedaling uphill while laughing is definitely a challenge not to be missed. 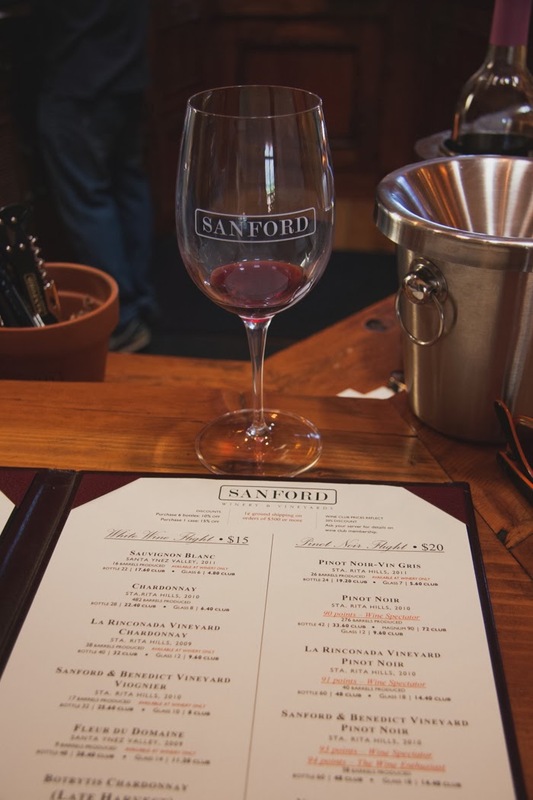 Our next stop was at the LaFond Winery tasting room where we excitedly began our second pre-lunch wine flight of the day. Good thing we had that biscotti for breakfast! After we were done we made our way outside where our guide had set up a beautiful picnic lunch next to the vineyards. We had wraps & veggies & hummus (score!) all while enjoying the stunning view. After lunch it was time to suit up and bike another six miles to our next destination. Luckily it was mostly downhill this time. 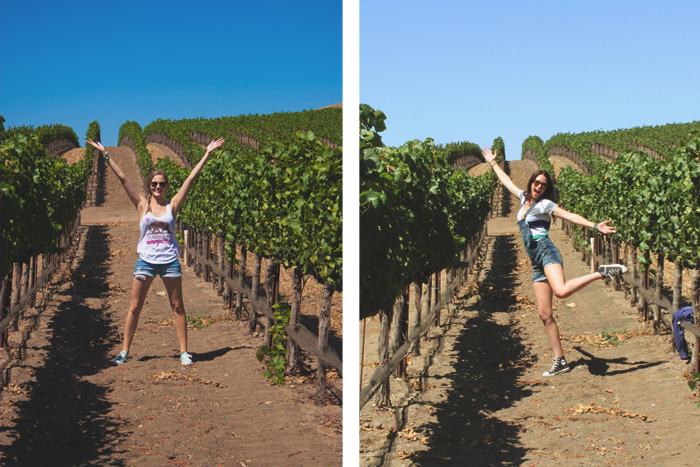 We made a quick trespass stop into some vineyards for a friendly photo op. And a few miles and one repaired bike chain later, we arrived at our final winery. Hugs were abound at this point. 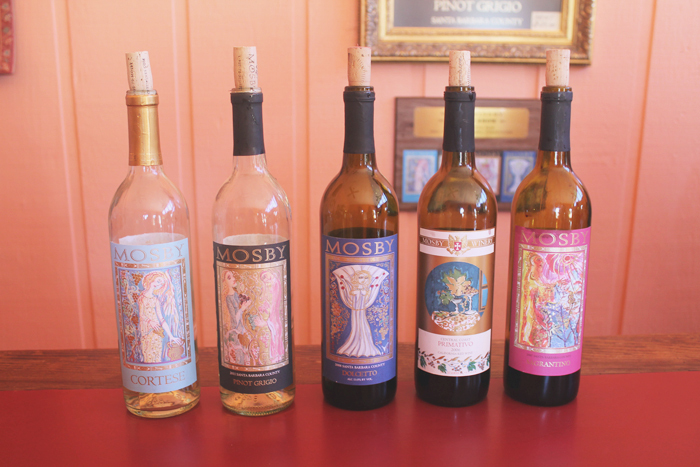 Mosby Wines call their wines Cal-Italian as the winemaker, Bill Mosby, was the first vintner in Santa Barbara County to produce Cortese wine made from a special grape that's native to the province of Piedemont in northern Italy. They've won awards for their gorgeous labels which are designed by a renowned Italian artist. To be totally honest, we mostly pretended to try these wines. After a 6 hour day of tastings & biking 12 miles in the sun we were ready to call it a day. Instead we enjoyed sampling large pours of their bottled water before loading our gear into the van and heading on our way. It was an amazing day and we had a great time with our awesome tour guide & new friends. 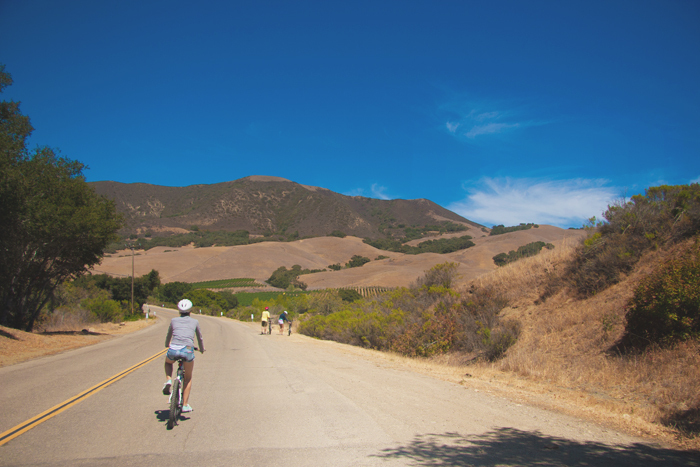 The weather was perfect and the Santa Ynez Valley was stunningly beautiful. 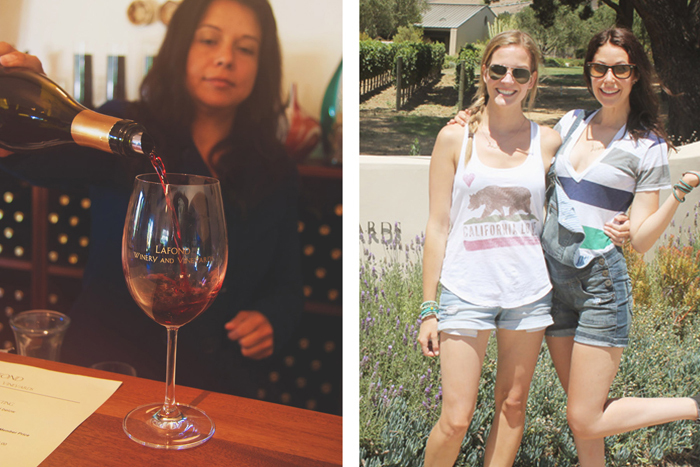 If you ever find yourself in Santa Barbara, we can't recommend this tour enough! We had looked up a great vegetarian restaurant that we wanted to try for dinner and our guide was generous enough to drop us off at the door. After dinner we made our way through downtown Santa Barbara and finally discovered why there had been no rooms or hotels available. The entire town was celebrating Fiesta! A huge, 90-year-old celebration honoring the history and traditions of the Spanish, Mexican and Native American settlers that founded Santa Barbara. We were told that this is the biggest celebration of the year and that the population more than doubles during this time! 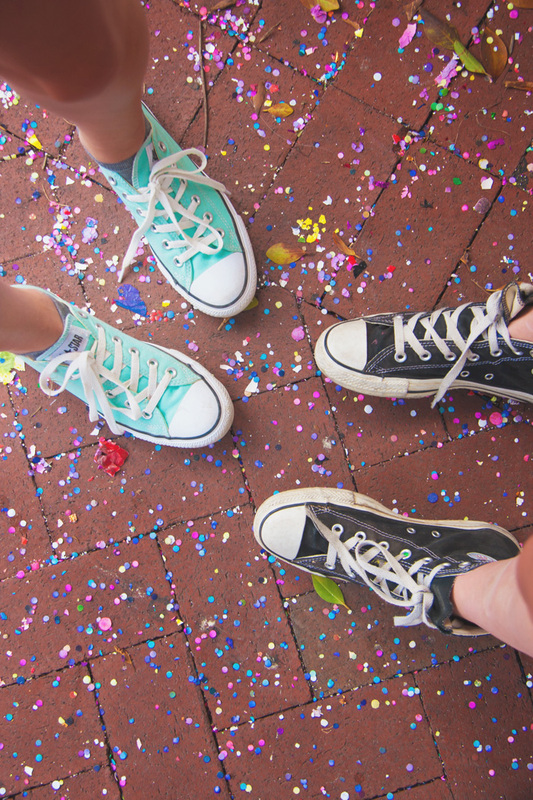 After buying some confetti eggs and smashing them over our heads we made our way back to the train station for the relaxing ride home. 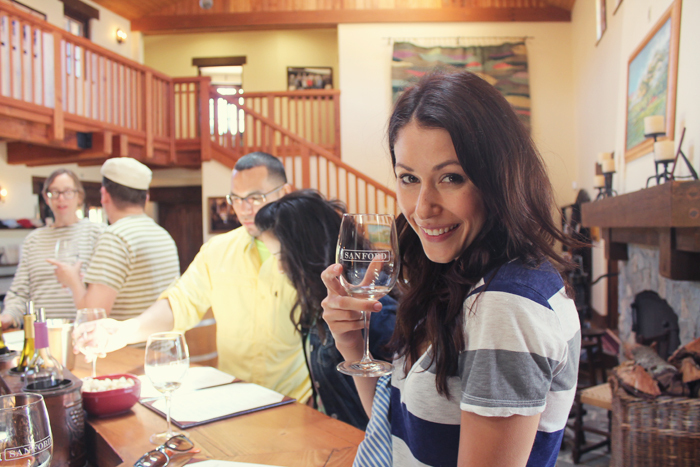 Our Granny Girls winery trip was a huge success and proved that spontaneity and overbooked hotels make for some of the best adventures.